XYZprinting has led the way in low-cost 3D printers by offering a variety of models that undercut higher-priced machines with similar capabilities. There are machines that print using using liquid resin (stereolithography) and professional-grade machines for rapid prototyping. Typically, XYZprinting's machines fall short on producing high quality builds, but the resolution and accuracy of their models are more than proportionate to the cost of the printers. 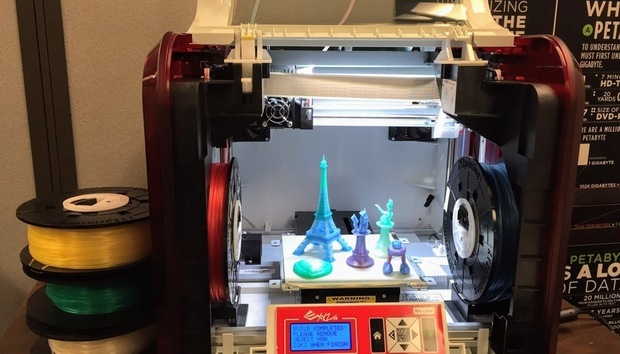 The company's latest 3D printer, the da Vinci Jr. 2.0 Mix, allows makers to print with two different colored filaments at the same time -- once again demonstrating XYZprinting's ability to offer special capabilities with a desktop printer at cut-rate pricing. At $450 (Amazon price), the da Vinci Jr. 2.0 Mix carries a hefty price premium over its predecessor -- the da Vinci Jr. 1.0, which retails for $200 (Amazon price). In the overall scheme of things, however, XYZprinting's machines are far less expensive than most 3D printers of comparable functionality. For example, I recently reviewed the Ultimaker 3, a machine from Dutch 3D printer company Ultimaker BV that is highly rated by the user community. The Ultimaker 3 also has dual extruder capability, though it cannot mix colors because it prints from two separate heads. While I found the machine's resolution to be outstanding, it was problematic both in its ability to print multiple colors and its automatic leveling feature. At $3,495, the Ultimaker 3 is also vastly more expensive. The da Vinci Jr. 2.0 Mix uses a new dual-feed system to send two filaments to a single extruder module to create a print that either gradually changes color, creates separate layers of two colors or mixes two colors to create a third one.The filament meets at the tip, extruding and retracting when necessary based on the settings in XYZware slicer software. Using that software, users can experiment with different filament color types and can choose from Multicolor Mode or Mixer Mode. Multicolor Mode allows users to choose two colors with which to print and the software then proportionally mixes them in varying tones. A Pokemon-style chess piece printed using XYZware's "Mixer Mode," which allows makers to change colors throughout the model. Mixer Mode splits color blocks according to height, with each block containing a single color or a set of graduated color blocks. In other words, you can print using two distinct colors or print a gradient between the colors to create a third color, such as using blue and yellow to produce green. XYZprinting offers five different colors and one transparent PLA filament with which to print (the printer only uses PLA filaments). The Mix is a substantial machine measuring 16.54 x 16.93 x 14.96 in. While at 37.47 lbs. it's not heavy, it will eat a good amount of desktop space. It has a maximum build volume of 5.9 in. x 5.9 in. x 5.9 in., relatively typical of desktop printers. The pendant heart displayed how gradually the da Vinci Jr. 2.0 Mix adds in a second color, i.e., the transparent filament at its center. The printer has a resolution of .2 millimeters, or 200 microns, which is respectable though not remarkable. As with other XYZprinting 3D machines, the Mix comes with a 2.6-in. LED screen and cursor pad that allows you to browse a menu of commands, from loading and unloading filament to printing from the SD card. Getting this printer up and running, however, is extremely simple and shouldn't take anyone more than 15 to 20 minutes. One attribute I like about the da Vinci Jr. 3D printer lineup is that it employs a 9-point automatic calibration detection system that accurately determines the distance between the extruder and the print bed. This ensures that you can start printing right away without any manual calibration, as is required even in some more expensive 3D printers. For my first job, I used XYZprinting's included SD card to print a preloaded model that used the Mixer Mode. The model, a 2-in.-wide, 0.5-in.-high heart pendant, printed without issue and with decent resolution. The pendant went from a dark green gradient at its base to transparent at its center, which was a nice effect. The pendant was estimated by the printer to take 43 minutes to print. It printed in 35 minutes -- a pleasant surprise. The 5.5-in. tall model of the Eiffel Tower against the backdrop of the XYZware software used to slice it prior to printing. On the right side of the laptop screen you can see how the slicer software allows makers to mix filament colors. Next, I printed a Pokemon-style chess piece that contained some pretty good detail. The piece was estimated to take 38 minutes but took 48 minutes. Using XYZware, I chose to start the chess piece with a transparent filament and gradually increase the color to green at the top. It printed with good accuracy but average resolution. Next came my benchmark test for every 3D printer: the Eiffel Tower. The model is roughly 5.5-in. tall with a 2.25-in. base. It's a difficult test for any 3D printer to accomplish. A closer look at the Eiffel Tower build. This time, however, I was printing the tower with two filaments at the same time: Green filament at the base that was set up to gradually transform to blue at the top. Curiously, the XYZware software reversed that process and printed with blue at the bottom and green at the top. No matter -- the model came out as a decent representation of the Eiffel Tower. Upon closer inspection, the lattice work was muddled, likely due to the average resolution capability of the printer. However, a railing around a pedestrian crosswalk -- one of the more difficult elements to replicate on a 3D printer -- came out with impressive accuracy. The Eiffel Tower took roughly four hours to print. All in all, the XYZprinting da Vinci Jr. Mix was successful at printing a difficult object, and more importantly, did it on a system that costs one-fifth that of Makerbot's machine and with two different colored filaments. After experiencing the problems with getting the color settings in the XYZware right, I contacted XYZprinting and they suggested downloading a fresh version of their slicer software. I did that, and the very next model I printed -- another Pokemon chess piece -- came out with the correct color mix. Lastly, I attempted to print a two-piece model of a Smurf figurine. The figurine should have measured about 3 in. high and the two pieces should have had two separate colors (red and blue). Unfortunately, I had adhesion issues and one part of the model detached, ending the print job for the upper half of the model; the lower half, however, printed successfully. Speaking of adhesion: One shortcoming of the lower-end da Vinci 3D printers is their print beds, which are not heated. Heated print beds enable the plastic object being printed on them to adhere better. In the absence of a heated print bed, XYZprinting suggests that users cover the surface with masking tape for better adhesion (they supply three square sheets of masking tape for starters). As with other XYZprinting machines, however, masking tape alone doesn't solve the adhesion issue. My first attempt at an Eiffel Tower print failed because it detached a few minutes into the job. XYZprinting also recommends you slather the masking-taped surface with a glue stick to increase adhesion. With all that, some models still tend to break away during a print, which is disappointing when a job is nearing completion after hours of printing. In one case, a model adhered too tightly and ended up taking masking tape with it when I detached it. But using the correct combination of tape and glue does tend to solve the adhesion issue in most cases. One other annoyance is the way the 3D printer loads and unloads filament. You have to do both spindles at the same time. It would be better to be able to load or unload one or the other. Lastly, in terms of loading .STL model files into the XYZware slicing software, every single time I did it I received a pop-up telling me there was a problem found with the model and would I like to use "auto repair." It was a minor inconvenience as the auto repair function did seem to fix whatever issue was present with every model I printed. XYZprinting's da Vinci Jr. Mix is a low-cost, 3D printer suited for beginner and intermediate makers. The quality of this machine for the price is outstanding. Will you be making accurate prototypes for developing new products for your corporation? No. But, can you enjoy being creative in playing with various color plastics to make objects that few other machines can produce for the cost of this machine? Yes. I don't often recommend desktop 3D printers because they either fail in the execution of a job or they downright fail to live up to printing high-quality models based on the high price of the machine. With that said, I can recommend the da Vinci Jr. Mix based on its ability to accurately create highly detailed print jobs with decent results, and perform those print jobs in multiple colors.